Mumbai: Tata Sons Ltd, the holding company of the diversified Tata group, has offered to buy or make arrangements to buy any unsold ordinary shares in Tata Motors Ltd’s ongoing rights issue, in a display of confidence that will also ensure that the issue does not devolve. This will be in addition to any shares acquired by Tata Sons in proportion to its existing 21.91% holding in the country’s largest truck and bus maker, according to Tata Motors’ filings to capital markets regulator, the Securities and Exchange Board of India, or Sebi. The decision reflects the confidence of the promoters in the company, said the executive director of an investment bank that has lead-managed many other right issues who did not want to be identified because he has managed issues for rival firms. Tata Motors is raising Rs4,145.8 crore to repay part of the $3 billion (about Rs13,900 crore at current exchange rates) bridge loan it took from eight banks, including State Bank of India, to purchase Ford Motor Co.’s Jaguar and Land Rover businesses for $2.3 billion last year. 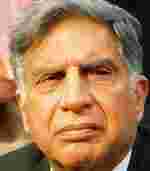 The loan was guaranteed by Tata Motors and is to be repaid by 2 June 2009. The rights issue opened on Monday and will close on 20 October. In its issue prospectus, Tata Motors assured Sebi that public shareholding in the company will not fall below 10%, as specified in the listing agreement with stock exchanges. The company also said Tata Sons, along with group companies Tata Steel Ltd and Tata Industries Ltd, has given a commitment to the rights issue underwriters, JM Financial Consultants Pvt. Ltd, not to sell their shares for 90 days from the date of devolvement notice if the so-called “A" ordinary shares are unsold in excess of 35%. The three companies would buy the “A" shares in proportion to their stake in the company, it added. Tata Steel Ltd has 8.4% stake in Tata Motors, while Tata Industries Ltd holds 2.01%. A shareholder who subscribes to “A" shares will have differential rights with regard to voting and dividend. The shareholder will be entitled to one vote for every 10 “A" shares held but will get 5 percentage points more dividend than that declared on each of the ordinary shares. Investment banker JM Financial and two affiliates have assured Tata Motors they will underwrite up to Rs1,327 crore for 43,509,230 of the total 64,276,164 “A" shares being sold at Rs305 a share to raise Rs1,960.4 crore. Apart from the “A" shares, Tata Motors is also issuing one ordinary share for every six owned by shareholders at Rs340 each to raise Rs2,185.4 crore. On Wednesday, Tata Motors shares fell 1.44% to close at Rs339.25 on the Bombay Stock Exchange, while the benchmark Sensex index rose 1.52% to 13,055.67 points. Tata Motors reported annual sales of Rs35,651.4 crore for the year ended March. In a report released Wednesday, Mathur said difficult financing conditions and rising cost of ownership have caused a slowdown in automobile sales since April, and that the deceleration would continue until 2009-10. Sluggish demand has made it necessary for players to partly absorb input cost increases resulting in lower margins, he added. Falling demand for medium and heavy commercial vehicles (MHCV) is mainly linked to the overall slowdown in industrial production. Transporters have deferred purchases despite stable freight rates, with rising cost of ownership hurting profits amid concerns over freight demand sustainability. Due to demand-related concerns, freight rates are expected to decline in the second half of 2008-09, further affecting transporter profitability, Mathur said. Crisil research expects MHCV volumes to continue to decline by 5-10% in 2008-09. Light commercial vehicles, which have been clocking healthy double-digit growth over the past few years, are expected to register single-digit growth in 2008-09 owing to the existing high base. Tata Motors has a 67% market share in this segment. The risk advisory firm expects single digit growth rates to continue for automobile segments in 2009-10.